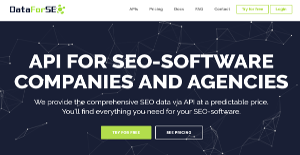 DataForSEO is an API suite designed to help SEO-software companies and agencies gather the SEO data they need for their projects. It features a powerful solution that provides users with of tasks for Rank tracking API, SERP API, Google keyword planner API and On-page APIs in a matter of moments. It features high-speed delivery and a reliable system that is stable and comes with a 99.99% availability guarantee. With DataForSEO, information is accurate and fresh. That means you are always working with reliable and up-to-date information, helping you make smart decisions and immediate actions that drive business growth. Its users include SEO powerhouses like Agency Analytics, SEO Crawler, Optimonk, RankSonic, and RankActive to name a few. SEO companies and agencies require up-to-date, reliable data to work with. Their industry demands that. DataForSEO ensures that they are always working with fresh data with its proprietary data harvesting technologies and robust APIs. It also helps that DataForSEO provides top class support during the whole process of implementation. You can also opt to contact their support via the communication channel of your choice, whether it’s through group chat, Skype, or other means. With the software’s Rank Tracking API, you will now how a keyword ranks in a particular location. This provides you with the freshest position of your keywords without compromising its accuracy. You are fully aware how your keywords are ranked and this gives you an idea of how much work is required to get to your target rank. The SERP API delivers the Top 100 results from the SERPs (search engine results page) for a specific keyword. If you are interested in a particular keyword, this API gives you the list of paid and organic results from SERPs. With the Keyword Data API, you are supplied with data for COC, competition, and search volume. Knowing your competition is essential in the SEO business. DataForSEO gives you the tools you need to know how your competitors’ websites are doing in terms of traffic. Information including data sources, bounce rates, pageviews, and time on site are delivered to you quickly and in a format that you can easily comprehend. What Problems Will DataForSEO Solve? 1. You have an SEO software, and need trustworthy data sources – DataForSEO is ready to provide them. The software offers Rank tracker API, SERP API, Keywords data API, Competitor API, URL metrics API, such data as DA, PA, TF, CF for each URL. 2. DataForSEO provides you API which functionality is simple and doesn’t require completing of any unnecessary steps. You don’t need to waste your time on additional actions such as creating projects, adding keywords and so on. You just set a task to retrieve data from the system, and it returns everything in the result array to you. Enterprises have different needs and requirements and no software platform can be perfect in such a condition. It is pointless to try to find a perfect out-of-the-box software app that meets all your business wants. The intelligent thing to do would be to adapt the application for your specific wants, worker skill levels, budget, and other elements. For these reasons, do not rush and subscribe to well-publicized trendy solutions. Though these may be widely used, they may not be the best fit for your particular needs. Do your groundwork, check out each short-listed application in detail, read a few DataForSEO reviews, speak to the seller for explanations, and finally choose the product that offers what you want. How Much Does DataForSEO Cost? DataForSEO offers a flexible enterprise pricing scheme based on a pay-per-use model. Contact DataForSEO for payment and other product details. We realize that when you make a decision to buy Search Marketing Software it’s important not only to see how experts evaluate it in their reviews, but also to find out if the real people and companies that buy it are actually satisfied with the product. That’s why we’ve created our behavior-based Customer Satisfaction Algorithm™ that gathers customer reviews, comments and DataForSEO reviews across a wide range of social media sites. The data is then presented in an easy to digest form showing how many people had positive and negative experience with DataForSEO. With that information at hand you should be equipped to make an informed buying decision that you won’t regret. Works but minimum pricing tier is expensive. What are DataForSEO pricing details? What integrations are available for DataForSEO? Pros: APIs they provide are very easy to work with. Amazing support team and extensive docs add to the positive impression. These folks provide all the SEO data our company needs. Cons: It certainly takes time to understand their pricing model. Pros: The APIs are good, the documentation is well made and has working examples. Cons: The APIs have frequent outages so if you depend on it, look for some other service. The 99.99% uptime SLA is a blatant lie. We're currently suffering from an outage of more than 84 hours even though support told us it would be fixed within 48 hours. It's also a problem that they try to hide these outages instead of actively informing their clients. Even after more than 80 hours and begging for open communication we still didn't get a single email about the issue.Also the support will usually try to blame reported bugs on the customer instead of checking for errors on their side. The service is generally not tech savvy and doesn't know what they are talking about. Customer Support and Feature Set, Website and example API code is exemplary. The APIs are good, the documentation is well made and has working examples. If you need more information about DataForSEO or you simply have a question let us know what you need and we’ll forward your request directly to the vendor.